It happens all the time - you're using a product and an idea which has the potential to make that product better comes to mind. Wouldn't it be great if you could submit your product enhancement ideas directly to the product team and potentially having it added to a future release? 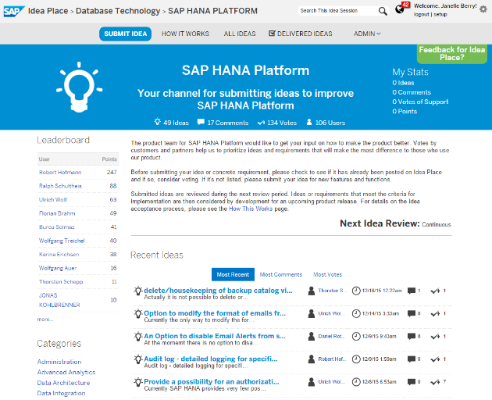 SAP HANA on Idea Place gives you this opportunity. At this user community site you can submit product enhancement ideas or vote on ideas from others. SAP HANA product team will consolidate and track all ideas, but the most popular ideas will be directly reviewed by the SAP HANA Product Management and Develpment team on a regular basis. When accepted, an idea will be considered for inclusion in future releases. Continously listening to, co-innovating with, and learning from customers is crucial for the success of SAP HANA. Product enhancement ideas are one way we listen to and co-innovate with customers and partners. But how are enhancement requests chosen and will an idea become part of the product one day? And what are the most wanted product enhancements being at the list for many customers? Any customer or partner can submit ideas, comment, and vote. We will accept product ideas based on the value they deliver to our customers and our product strategy. We prioritize reviews of popular ideas because the number of votes an idea receives represents its value for our customers. The voting on ideas allows us to understand which ideas are of the highest interest to the most users. It gives every user a voice. 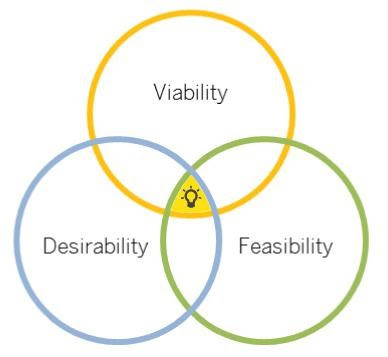 A good idea should have three attributes: desirability, viability, and feasibility and we generally consider ideas based on those criteria. Desirability means "do customers want it?". We evaluate the desirability of an idea based on the number of community votes on the website. We also take into consideration if the same idea has been brought up before by other customers through other means. The viability expresses the degree of business sense that an idea has for SAP. It is determined by its alignment with the future direction of the product, if it fit with SAP market strategy and how it compares with other ideas that might have a higher priority because they provide more business value to more customers. Feasibility means that the idea needs to be technically feasible. Is it technically possible to build it? Will it destabilize the core product or other features? How much time will it take to build? Is resource time available with all other requirements needing to be built? To make sure your idea is understood by the SAP HANA Idea Place community, you should describe the product enhancement as detailed as possible. Also explain the business reason for requesting the idea. Further, information about the landscape, settings, and applications might be helpful. If applicable, make aware of any other dependencies. We track submitted ideas and get actively involved at the point when an idea has been prioritized by a good number of users. Both the owner and follower of the idea get notified every time the status of an idea has been changed. In this way, you get informed when ideas are being reviewed and if they've been delivered. Check out the SAP HANA Idea Place today. Give your vote to potential product enhancements, submit your ideas and help us make SAP HANA even better! Note: submissions are conditional on acceptance of the Term of Use (ToU) agreement. SAP has the exclusive right to make the final determination on whether/when/how a feature will be added to the product.